Posted on December 14, 2017 , in Hot Tubs. People have used water therapy and hot springs to relax and aid in pain relief for thousands of years. Hot tub hydrotherapy treatment was established in the 1940s as a way for people to luxuriously soak stress away and massage sore muscles. Most people today recognize hot tubs as a means for relaxation and entertainment, but their therapeutic benefits still hold true. We have listed some of those therapeutic benefits that you can enjoy while soaking in your very own hot tub. Part of the reason hot tubs help joints and other body pains are because your body weighs approximately 90% less in water then when it is on land. This is called water buoyancy and is why we can freely move our joints without weight or pressure. In water, the stress on our joints is removed. Therefore, those of us that suffer from arthritis pain can move our bodies with ease and perform physical activity in the water. At night, to help your body transition quicker into a more restful and restorative sleep, take a soak in the hot tub. While you should not immediately jump into bed after a hot tub session, your body temperature may be a bit too high, it is recommended to do it 60 – 90 minutes later. Some individuals can find themselves constantly having to struggle with sports injuries. Hydrotherapy is an incredibly helpful way to help treat these pains. The hot water helps promote circulation, repair damaged tissue, and ease muscle spasms. With a hot tub, you can easily immerse your body in superficial heat therapy. Your muscles will loosen, and your range of motion will increase due to the water’s buoyancy. When you enter a heated hot tub your blood vessels will begin to dilate. This will increase the flow and pressure of blood throughout the body. If you suffer from joint or muscle pain this can be beneficial since it will help deliver essential oxygen and enzymes to areas of the body suffering from pain. 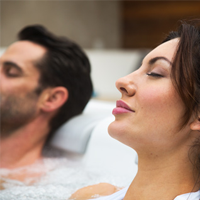 A soak in a warm soothing hot tub can reduce your stress levels. Many hot tubs come with hydrotherapy massage programs designed to target specific areas of the body that will release endorphins. Endorphins are a natural stress reliever and painkiller. Also, when you experience the warm water, your blood vessels will dilate and help reduce the occurrence of a migraine and tension headaches. One of the benefits we are all sure to love is the amount of time you will get to spend with your family and friends at your home or in your backyard. This unique setting will provide the greatest relaxation and encourage conversations, connections, and positive relationships, improving our overall health. If you are suffering from chronic pain, injuries, or inflammation a hot tub can be the perfect way to seek treatment. The therapeutic benefits offered to individuals suffering from these conditions are substantial. Many people love using hot tubs to help with their carpal tunnel syndrome, tendonitis, insomnia, stomach problems, and headaches. Muscle tightness and tension will loosen when experiencing the warm water combined with the therapeutic massage jets. There are plenty of therapeutic benefits to hot tubs, but this is just the beginning, learn more by downloading a hot tub buyer’s guide.